Two learning solutions produced by SweetRush in collaboration with its clients were honored with Awards for Excellence in this writing- and communications-focused competition. 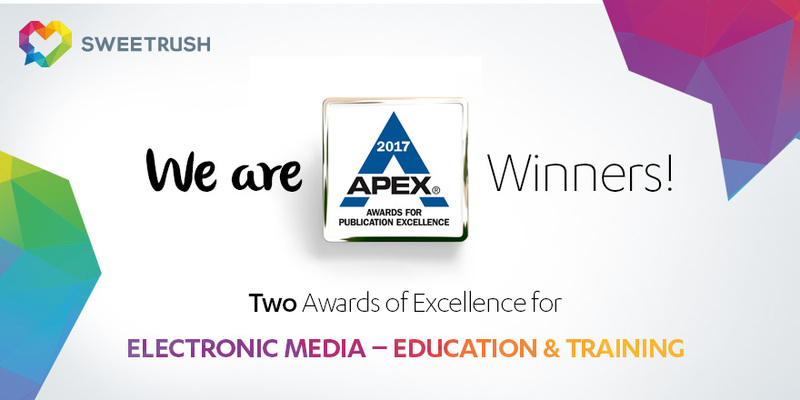 San Francisco, Calif., August 7, 2017 — The results of the 29th Annual APEX Awards for Publication Excellence have been announced, and SweetRush was named the winner of two Awards of Excellence in the category of Electronic Media – Education & Training. One winning learning solution, designed in collaboration with Bridgestone Americas, was a scenario-based game that helped tire sales associates master their skills and be successful in their jobs. The other winner, an educational and motivational animated video created for hospitality training, resulted from a creative partnership with Hilton. Awards were offered in 100 individual categories that fell within 11 main categories that included newsletters; magazines, journals, and tabloids; annual reports; print media; electronic media; social media; websites; campaigns, programs, and plans; writing; design and illustration; and one-of-a-kind publications. The APEX Awards for Publication Excellence is an annual competition for publishers, editors, writers, and designers who create print, web, electronic, and social media. Communications Concepts, Inc., the sponsor of the APEX Awards, advises professionals who write, edit, and manage business communications on best strategies and practices. Communications Concepts also publishes business communication reports, including Writer’s Web Watch, an e-report for professional communicators, and special reports on topics such as corporate writing and web publishing.